Background: Visual dysfunction is one of the most common causes of disability in multiple sclerosis (MS). The Multiple Sclerosis Functional Composite (MSFC), a new clinical trial outcome measure, does not currently include a test of visual function. Objective: To examine contrast letter acuity as a candidate visual function test for the MSFC. Methods: Binocular contrast letter acuity testing (Sloan charts) was performed in a subgroup of participants from the International Multiple Sclerosis Secondary Progressive Avonex Controlled Trial (IMPACT Substudy) and in MS patients and disease-free control subjects from a cross-sectional study of visual outcome measures (Multiple Sclerosis Vision Prospective cohort [MVP cohort]). High-contrast visual acuity was measured in both studies; MVP cohort participants underwent additional binocular testing for contrast sensitivity (Pelli–Robson chart), color vision (D-15 desaturated test), and visual field (Esterman test, Humphrey Field Analyzer II). Results: Contrast letter acuity (Sloan charts, p < 0.0001, receiver operating characteristic curve analysis) and contrast sensitivity (Pelli–Robson chart, p = 0.003) best distinguished MS patients from disease-free control subjects in the MVP cohort. Correlations of Sloan chart scores with MSFC and Expanded Disability Statue Scale (EDSS) scores in both studies were significant and moderate in magnitude, demonstrating that Sloan chart scores reflect visual and neurologic dysfunction not entirely captured by the EDSS or MSFC. Conclusions: Among clinical measures, contrast letter acuity (Sloan charts) and contrast sensitivity (Pelli–Robson chart) demonstrate the greatest capacity to identify binocular visual dysfunction in MS. Sloan chart testing also captures unique aspects of neurologic dysfunction not captured by current EDSS or MSFC components, making it a strong candidate visual function test for the MSFC. The Multiple Sclerosis Functional Composite (MSFC) was recently developed as a more sensitive multidimensional measure of neurologic function for use in MS trials. It includes quantitative tests of leg function/ambulation (Timed 25-Foot Walk [T25FW]), arm function (9-Hole Peg Test [9HPT]), and cognition (Paced Auditory Serial Addition Test with 3-second interstimulus interval [PASAT3]) but does not currently include a test of vision.6,8-10⇓⇓⇓ Snellen acuity was examined by the National Multiple Sclerosis Society Task Force that developed the MSFC but lacked sufficient sensitivity to be included as an MSFC component.6 Like current MSFC components, candidate visual measures for the MSFC should be quantitative tests of visual function (i.e., binocular vision—analogous to measuring ambulation) rather than impairment (i.e., monocular acuity—analogous to measuring individual leg strength). We examined contrast letter acuity (Sloan charts) as a candidate visual function test for the MSFC. Our assessments were based on the capacity of Sloan chart scores to distinguish MS patients from disease-free control subjects and on the relation of Sloan chart scores to scores for the EDSS and MSFC in two MS cohorts. Low-contrast Sloan letter chart testing (Sloan charts; Precision Vision, LaSalle, IL) was administered to a subgroup of participants in the International Multiple Sclerosis Secondary Progressive Avonex Controlled Trial (IMPACT Substudy).10 Data from an observational study of visual outcome measures in MS at the University of Pennsylvania, the Multiple Sclerosis Vision Prospective cohort (MVP cohort), were also analyzed. The MVP cohort participants include patients with MS and disease-free control subjects (family members and staff) from a cross-sectional study designed to determine which clinical tests best identify visual dysfunction in MS patients. 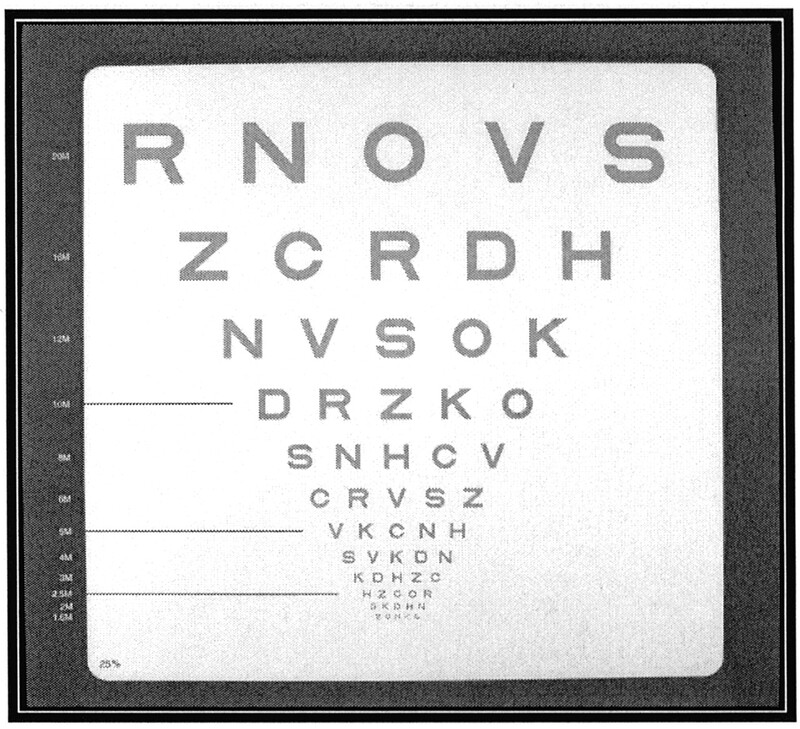 Sloan charts have a standardized format based on Early Treatment Diabetic Retinopathy Study (ETDRS) visual acuity charts, the standard used for ophthalmology clinical trials (figure 1).18-20⇓⇓ Each Sloan chart corresponds to a different contrast level (shade of gray letters on white/retroilluminated background); charts are scored based on the number of letters identified correctly. This format provides continuous (interval) scoring and may allow Sloan charts to capture losses of contrast at small letter sizes that have been reported in MS and other neurologic disorders.21 To facilitate comparisons between the IMPACT Substudy and MVP cohort, letter scores from the 1.25% contrast chart, the lowest contrast level used in both studies, were used for statistical analyses. Figure 1. Low-contrast Sloan letter charts (Sloan charts; Precision Vision, LaSalle, IL). These charts have a standardized format based on Early Treatment Diabetic Retinopathy Study visual acuity charts, the standard used in ophthalmology clinical trials. This photograph shows the 5% contrast level. The charts measure 13.5 × 14.5 inches for easy use and portability in the clinical setting. Sloan charts may also be mounted on a retroilluminated cabinet, thus eliminating the need for standardization of room lighting levels. High-contrast visual acuity testing was performed in both studies (ETDRS charts at 3.2 m18,19⇓ in MVP cohort, Sloan charts at approximately 100% contrast level at 2 m11,21⇓ in IMPACT Substudy). Additional binocular vision tests were administered to MS patients and disease-free control subjects in the MVP cohort, including contrast sensitivity (Pelli–Robson chart; Lombart Instrument Co., Norfolk, VA),13,14⇓ color vision (L’Anthony D-15 desaturated test, Luneau, France),25,26⇓ and binocular visual field (Esterman test, Humphrey Field Analyzer II, model 740; Zeiss Humphrey Systems, Dublin, CA).27,28⇓ Uniform lighting levels (85 cd/m2) were used, including retroilluminated charts for contrast letter acuity and high-contrast visual acuity testing in the MVP cohort. A MacBeth Easel Lamp and matte black testing surface were used for color vision testing.14 Patients and disease-free control subjects in the MVP cohort underwent detailed refractions prior to vision testing to minimize potential bias with respect to correction of refractive error. Refractions were performed for each eye at 3.2 m (ETDRS chart R) and adjusted for appropriate distances for other vision tests. Vision testing for the MVP cohort was performed by a trained ophthalmic technician experienced in the performance of examinations for research studies. Although it was not possible for the examining technician to be masked to MS vs control group status for all MVP cohort participants, strict standardized protocols, including written scripts and instructions for testing, were followed for all participants to minimize potential bias. The examining technician was masked to specific study hypotheses. Summary scores for visual function tests were calculated as follows: 1) Sloan charts: number of letters identified correctly (maximum 70); 2) ETDRS visual acuity: number of letters identified correctly (maximum 70); 3) Pelli–Robson charts: log contrast sensitivity; 4) D15-DS color test: C-index (confusion index); 5) Esterman visual field: Esterman efficiency score (maximum 100). For comparison of vision tests in the MVP cohort, scores were converted to SD units (SDU) in the abnormal direction from the control group mean to ensure uniformity of scaling. The MSFC and EDSS were administered to MS patients in the IMPACT Substudy and MVP cohort according to standard protocols.29,30⇓ For analyses of the relation of Sloan chart scores with MSFC scores, MSFC component (T25FW, 9HPT, PASAT3) and Sloan chart scores (1.25% contrast level) were converted to Z scores based on the number of standard deviations from the mean baseline score for each study group.8,9,30⇓⇓ The MSFC composite Z score was calculated as follows: MSFC Z score = (Z9HPT+ ZT25FW + ZPASAT)/3.0; this score is referred to herein as the MSFC-3. A composite Z score including the three MSFC components and the Sloan chart scores (1.25% contrast level) was also calculated as follows: MSFC-4 Z score = (Z9HPT + ZT25FW + ZPASAT + ZSloan 1.25%)/4.0. One hundred thirty patients with MS (mean age 46 ± 9 years) and 90 disease-free control subjects (mean age 36 ± 12 years) participated in a single testing session for the MVP cohort. Data from the IMPACT Substudy 12-month visit (n = 56; mean age 47 ± 8 years) were also analyzed. All patients in the IMPACT Substudy had secondary progressive MS based on trial inclusion criteria. In contrast, 63% of patients in the MVP cohort (n = 82) had relapsing–remitting MS; other cases were classified as secondary (31%; n = 40) or primary (6%; n = 8) progressive. MS patients in both studies were similar to the US MS population with regard to age, gender (70% female), and race (82% Caucasian). Median disease duration in the MVP cohort was 7 years (range 0 to 43 years); 87% in the MVP cohort were receiving standard immunomodulatory therapies, and 38% of IMPACT Substudy participants were receiving active treatment (interferon β-1a 60 μg IM weekly). Median binocular Snellen visual acuities were 20/20 or better (range 20/12.5 to 20/100) in both studies. 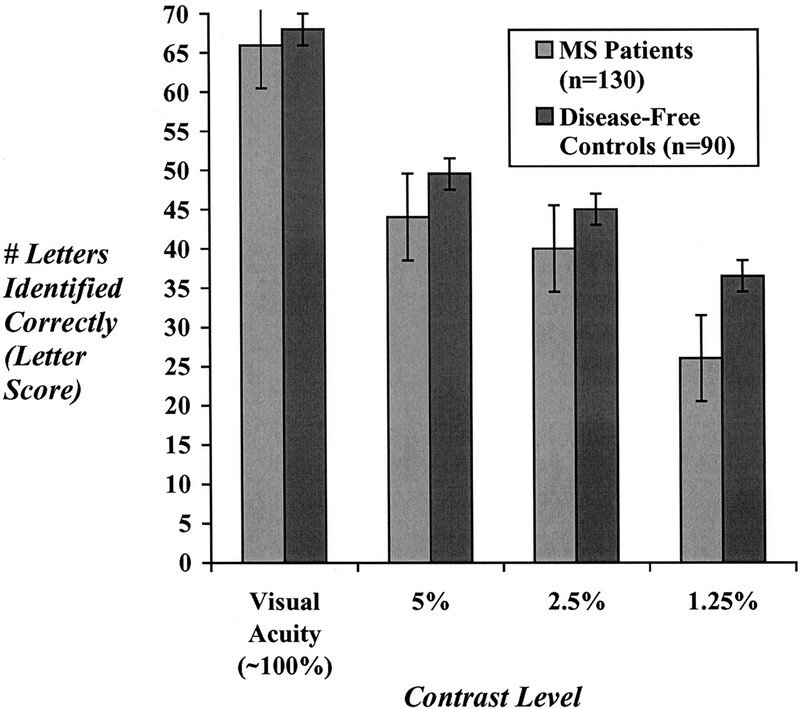 Despite nearly equal median visual acuity scores for MS patients and disease-free control subjects in the MVP cohort (difference of 2 letters), progressively greater differences were observed for contrast letter acuity scores at decreasing contrast levels (Sloan charts at 5, 2.5, and 1.25%; p < 0.0001 for all levels; figure 2). These differences were noted even following detailed correction of refractive error in both the MS and the disease-free control groups. Figure 2. Median binocular letter scores for high-contrast visual acuity (Early Treatment Diabetic Retinopathy Study and Sloan charts at approximately 100% contrast level, maximum score = 70) and for Sloan charts at 5, 2.5, and 1.25% contrast levels (maximum scores = 70) for multiple sclerosis (MS) patients vs disease-free control subjects in the Multiple Sclerosis Vision Prospective cohort. Vertical bars indicate interquartile range (25th to 75th percentile observations) for each median score. Lower contrast levels (%) correspond to lighter gray letters on the white background. Despite nearly equal scores for visual acuity (difference in median scores = 2 letters), greater differences were observed for contrast letter acuity scores at lower contrast levels, particularly 1.25% (p < 0.0001 for all levels). These differences were noted even following correction of refractive error in both the MS and the control groups. Among five candidate visual function tests in the MVP cohort (table 1), only contrast letter acuity (Sloan charts at 1.25% level) and contrast sensitivity (Pelli–Robson chart) distinguished MS patients from disease-free control subjects to a degree that was significantly better than high-contrast visual acuity (p < 0.0001 vs visual acuity for Sloan charts; p = 0.003 vs visual acuity for Pelli–Robson chart).31 Accounting simultaneously for age, Sloan and Pelli–Robson charts again demonstrated the greatest capacity to distinguish MS patients from control subjects (figure 3). Odds ratios in favor of MS for worse scores were 2.41 (95% CI 1.77, 3.29; p < 0.001) for Sloan charts and 1.77 (95% CI 1.38, 2.26; p < 0.001) for Pelli–Robson. Among the youngest participants (age quartiles 18 to 32 and 33 to 43 years), only Sloan charts distinguished MS patients vs control subjects to a degree that was significant (p = 0.001 for both quartiles, logistic regression analysis). Figure 3. Logistic regression analyses demonstrating capacity for each visual function test to predict multiple sclerosis (MS) vs disease-free control status in Multiple Sclerosis Vision Prospective cohort, accounting simultaneously for age. 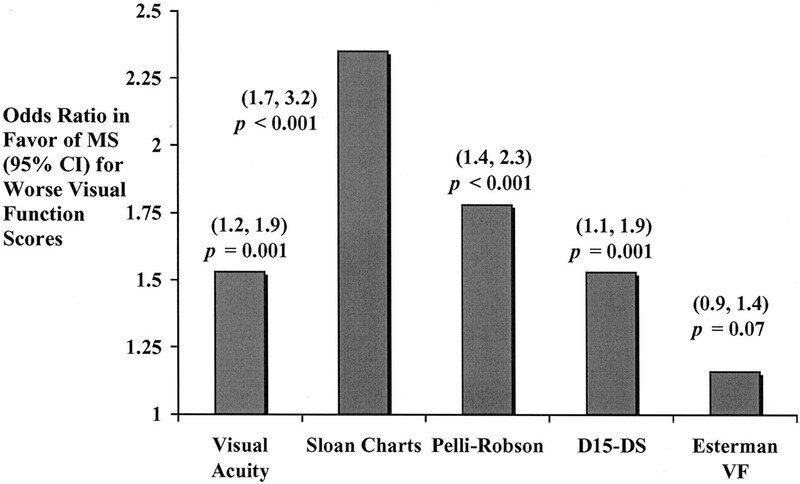 Odds ratios in favor of participants with worse vision scores being MS patients (vs disease-free controls) were greatest for contrast letter acuity (Sloan charts) and contrast sensitivity (Pelli–Robson chart). These measures thus best distinguish MS patients from disease-free control subjects, even after accounting for age differences between the two groups. VF = visual field. Rank correlations of Sloan chart scores with MSFC-3 and EDSS were significant and within an appropriately modest to moderate range (0.32 ≤ |rs| ≤ ∼0.55) for both the IMPACT Substudy and the MVP cohort (table 2), demonstrating that Sloan charts capture aspects of neurologic dysfunction not entirely captured by the MSFC-3 or EDSS. When Sloan chart scores were added to the MSFC-3, thus creating a four-item composite measure (MSFC-4), rank correlations were similar in magnitude to those observed between the MSFC composite Z scores (MSFC-3 and MSFC-4) and scores for the MSFC components (T25FW, 9HPT, PASAT3) (see table 2). Correlations between MSFC-3 composite and component scores (see table 2) were somewhat higher than those obtained in previous investigations performed to design and evaluate the MSFC but were still within a modest to moderate range.8,9⇓ Components of the MSFC-4 all demonstrated similar correlations with MSFC-4 composite scores, indicating that each component, including Sloan charts, contributes relatively equally to the overall MSFC-4. Correlations with EDSS were similar for MSFC-3 and MSFC-4, consistent with the strong contribution of ambulation status to the EDSS and the relative insensitivity of Snellen acuity (measure used in EDSS) to visual dysfunction in MS patients. Results of these investigations demonstrate that, among clinical visual function tests, contrast letter acuity (Sloan charts) and contrast sensitivity (Pelli–Robson charts) best distinguish MS patients from disease-free control subjects and thus have the greatest capacity to identify binocular visual dysfunction in MS populations. In analyses accounting for age, Sloan and Pelli–Robson charts were again best discriminators of MS patients vs disease-free control subjects. Sloan charts also capture aspects of visual and neurologic function not entirely captured by high-contrast visual acuity, EDSS, or MSFC scores in both relapsing–remitting and secondary progressive MS patients, making this measure a strong candidate vision test for the MSFC. The Pelli–Robson chart, a test of contrast sensitivity that uses large letters of uniform size (corresponding to approximately 20/680 Snellen equivalent at 1 m), was a significant discriminator of MS patients vs control subjects in the MVP cohort yet did not distinguish quite as well as Sloan charts in analyses accounting for age in our study group. As all letters on the Pelli–Robson chart are of a uniform large size (about 20/680 Snellen equivalent at 1 m),13,14⇓ this test may not capture selective losses of contrast at small letter sizes (20/25 to 20/15 Snellen equivalent) that have been reported in MS and other neurologic disorders.12,21⇓ Sloan charts have a standardized format (see figure 1) that allows for assessment of low-contrast vision at multiple letter sizes; these properties could in part explain the slightly greater discriminatory potential demonstrated by Sloan charts in this study cohort (see table 1; figure 3). Among the youngest participants in the MVP cohort (lowest age quartiles, 18 to 32 and 33 to 43 years), only Sloan charts distinguished MS patients vs control subjects to a significant degree. As younger patients are most likely to be in the earliest stages of MS, sensitive clinical outcome measures will be required, particularly in active arm comparison studies, to identify subtle dysfunction and to demonstrate treatment effects in these populations. Sloan charts demonstrated a slight advantage among the youngest participants in this study cohort. Sloan chart testing is a reliable, quantitative, and clinically practical measure of visual function that is feasible for administration by trained technicians in the clinical trial setting.11,20⇓ Testing of high-contrast visual acuity and three contrast levels requires a testing time of approximately 10 minutes. Standardized protocols, including instructions to be read to patients and strict rules for stopping testing, are used to minimize potential rater bias. Although it was not possible for the examining technician to be masked to MS vs control group status for all MVP cohort participants, standardized protocols were used, and comparisons between visual function tests were of greater importance than were comparisons of scores between MS patients and disease-free control subjects. The examining technician was masked to the study hypotheses. In these analyses, scores from the lowest contrast level (1.25%, single chart) were used to facilitate comparisons across the IMPACT Substudy and MVP cohorts. Future investigations may benefit from use of summary scores combining the 1.25% chart score with that from a higher contrast level to minimize potential floor effects (proportion of patients who receive score of 0). Reassuringly, combinations of the 1.25 + 2.5% and 1.25 + 5% chart scores in these studies yielded results similar to those obtained using the 1.25% chart score alone. Second, current components of the MSFC capture aspects of overall neurologic function (i.e., ambulation status) rather than specific individual components of impairment (i.e., individual leg strength). The use of a binocular vision test is thus analogous to the inclusion of a timed ambulation test (T25FW), rather than tests of individual leg strength or coordination (analogous to monocular acuity), in the MSFC. Binocular measures also have the added advantage of minimizing patient fatigue. Whereas monocular measurements may provide information on the physiologic function of each eye and optic nerve separately, bilateral afferent visual pathway involvement as well as efferent visual pathway abnormalities that affect binocular visual function are common in MS patients. Therefore, monocular measurements may not have the same degree of relevance to patient functioning, a feature considered important in selection of MSFC components.6,8⇓ As emphasized by Cutter et al.,8 clinical outcome measures may not capture every possible aspect of disease in MS (i.e., may not specifically assess unilateral optic nerve function) but will capture aspects of function that are important to patient care and assessment of treatment efficacy. Finally, data from the IMPACT Substudy demonstrate that whereas binocular Sloan chart scores (1.25% level) correlated modestly and significantly with EDSS scores (rs = −0.43, p = 0.001), monocular scores for better eyes (rs = −0.17, p = 0.26) and worse eyes (rs = −0.29, p = 0.05) did not correlate significantly with overall neurologic function. Our data therefore demonstrate that binocular testing provides a better measure of MS-related dysfunction for the clinical trial setting. In the IMPACT Substudy and the MVP cohort, correlations of Sloan chart scores with EDSS and MSFC scores (see table 2) were appropriately within a modest to moderate range; high correlations might indicate that Sloan chart testing does not provide additional information on neurologic function beyond current EDSS and MSFC components. Furthermore, correlations between MSFC-4 composite scores and scores for Sloan charts, T25FW, 9HPT, and PASAT3 were similar in magnitude, indicating that each component, including Sloan charts, contributed approximately the same degree to the overall MSFC-4 Z score. Correlations among MSFC-4 components were also modest, indicating that these components measure independent clinical dimensions of MS, including vision. These results are similar to those noted in previous investigations performed to design and evaluate the MSFC,8,9⇓ although correlations were somewhat higher in the current studies between component scores and the MSFC-3/MSFC-4. Data from these studies, both cross-sectional in design, strongly support a role for contrast letter acuity (Sloan chart) testing as an MSFC visual component. Large-scale longitudinal studies are underway to determine the capacity for Sloan chart testing and other visual function tests to demonstrate measurement properties recommended by the Task Force for MSFC components, including responsiveness to clinical change over time and the potential to demonstrate treatment effects.6,8⇓ Analyses of existing data are also ongoing to examine the relation of visual function, as measured by Sloan charts and other binocular tests, to health-related quality of life, MRI lesion burden, and other important aspects of MS disease. The degree to which Sloan chart scores may reflect progressive axonal loss within the visual pathways of MS patients is also under investigation. Contrast letter acuity (Sloan chart) testing is an effective method of visual assessment that, among clinical measures, has a significant capacity to identify visual dysfunction in MS patients. Sloan chart testing captures unique aspects of neurologic dysfunction not captured by current EDSS or MSFC components in both relapsing–remitting and secondary progressive MS populations. Collectively, these characteristics make Sloan chart testing a strong candidate visual function test for the MSFC. Supported by National Multiple Sclerosis Society grant RG 3208-A-1 (Dr. Balcer), NIH grant EY 013273 (Dr. Balcer), and Biogen, Inc. (IMPACT). Some authors of this manuscript have received grants/personal compensation for work on clinical trials (Drs. Balcer, Cohen, Pfohl, Bowen, Heidenreich, Markowitz, Galetta, and Cutter) or salaries in excess of $10,000 (Drs. Kooijmans and Sandrock) from Biogen, Inc. The authors thank the following individuals who provided patients for the MVP cohort study: Francisco González–Scarano, MD; Dennis L. Kolson, MD, PhD; Amy A. Pruitt, MD; A.-M. Rostami, MD, PhD; and Donald H. Silberberg, MD. McDonald WI, Barnes D. The ocular manifestations of multiple sclerosis. 1. Abnormalities of the afferent visual system. J Neurol Neurosurg Psychiatry . 1992; 55: 747–752. Newman NJ. Multiple sclerosis and related demyelinating diseases. In: Miller NR, Newman NJ, eds. Walsh and Hoyt’s clinical neuro-ophthalmology, 5th ed. Baltimore: Williams & Wilkins, 1998. Rudick RA, Miller D, Clough JD, Gragg LA, Farmer RG. Quality of life in multiple sclerosis: comparison with inflammatory bowel disease and rheumatoid arthritis. Arch Neurol . 1992; 49: 1237–1242. Ma SL, Shea JA, Galetta SL, et al. Self-reported visual dysfunction in multiple sclerosis: new data from the VFQ-25 and development of an MS-specific vision questionnaire. Am J Ophthalmol . 2002; 133: 686–692. Rudick R, Antel J, Confavreux C, et al. Clinical outcomes assessment in multiple sclerosis. Ann Neurol . 1996; 40: 469–479. Rudick R, Antel J, Confavreux C, et al. Recommendations from the National Multiple Sclerosis Society Clinical Outcomes Assessment Task Force. Ann Neurol . 1997; 42: 379–382. Kurtzke JF. Rating neurologic impairment in multiple sclerosis: an Expanded Disability Status Scale (EDSS). Neurology . 1983; 33: 1444–1452. Cutter GR, Baier MK, Rudick RA, et al. Development of a multiple sclerosis functional composite as a clinical trial outcome measure. Brain . 1999; 122: 871–882. Cohen JA, Cutter GR, Fischer JS, et al. Use of the Multiple Sclerosis Functional Composite as an outcome measure in a phase-3 clinical trial. Arch Neurol . 2001; 58: 961–967. Cohen JA, Cutter GR, Fischer JS, et al. Benefit of interferon β-1a on MSFC progression in secondary progressive MS. Neurology . 2002; 59: 679–687. Balcer LJ, Baier ML, Pelak VS, et al. New low-contrast vision charts: reliability and test characteristics in patients with multiple sclerosis. Mult Scler . 2000; 6: 163–171. Regan D, Neima D. Low-contrast letter charts as a test of visual function. Ophthalmology . 1983; 90: 1192–1200. Pelli DG, Robson JG, Wilkins AJ. The design of a new letter chart for measuring contrast sensitivity. Clin Vis Sci . 1988; 2: 187–199. Trobe JD, Beck RW, Moke PS, Cleary PA. Contrast sensitivity and other vision tests in the Optic Neuritis Treatment Trial. Am J Ophthalmol . 1996; 121: 547–553. Optic Neuritis Study Group. Visual function 5 years after optic neuritis: experience of the Optic Neuritis Treatment Trial. Arch Ophthalmol . 1997; 115: 1545–1552. Kupersmith MJ, Nelson JI, Seiple WH, Carr RE, Weiss PA. The 20/20 eye in multiple sclerosis. Neurology . 1983; 33: 1015–1020. Nordmann JP, Saraux H, Roullet E. Contrast sensitivity in multiple sclerosis: a study in 35 patients with and without optic neuritis. Ophthalmologica . 1987; 195: 199–204. Bailey IL, Lovie JE. New design principles for visual acuity letter charts. Am J Optom Physiol Opt . 1976; 53: 740–745. Ferris FL, Kassoff A, Bresnick GH, Bailey I. New visual acuity charts for clinical research. Am J Ophthalmol . 1982; 94: 91–96. Lynch DR, Farmer JM, Rochestie D, Balcer LJ. Contrast letter acuity as a measure of visual dysfunction in patients with Friedreich’s ataxia. J Neuroophthalmol . 2002; 22: 270–274. Bodis–Wollner I, Diamond SP. The measurement of spatial contrast sensitivity in cases of blurred vision associated with cerebral lesions. Brain . 1976; 99: 695–710. Azen SP, Varma R, Preston–Martin S, et al. Binocular visual acuity summation and inhibition in an ocular epidemiological study: the Los Angeles Latino Eye Study. Invest Ophthalmol Vis Sci . 2002; 43: 1742–1748. West SK, Munoz B, Rubin GS, et al. Function and visual impairment in a population-based study of older adults: the SEE project. Invest Ophthalmol Vis Sci . 1997; 38: 72–82. Rubin GS, Roche KB, Prasada–Rao P, Fried LP. Visual impairment and disability in older adults. Optom Vis Sci . 1994; 71: 750–760. L’Anthony P. Evaluation of the desaturated Panel D-15 II: comparison between the desaturated Panel D-15 and Farnsworth 100-hue tests. J Fr Ophtalmol . 1987; 10: 579–585. Bassi CJ, Galanis JC, Hoffman J. Comparison of the Farnsworth–Munsell 100-Hue, the Farnsworth D-15, and the L’Anthony D-15 desaturated color tests. Arch Ophthalmol . 1993; 111: 639–641. Esterman B. Functional scoring of the binocular visual field. Ophthalmology . 1982; 89: 1226–1234. Kuyk T, Elliott JL, Fuhr PSW. Visual correlates of mobility in real world settings in older adults with low vision. Optom Vis Sci . 1998; 75: 538–547. Kappos L, Lechner–Scott J, Lienert C. Neurostatus. Standardized neurological examination and assessment of Kurtzke’s functional systems and Expanded Disability Status Scale. Training CD-ROM for a standardized neurological examination and assessment of Kurtzke’s functional systems and expanded disability status scale for MS patients. Basel: Point de Vue Audio-Visual Productions, 1999. Fischer JS, Jak AJ, Kniker JE, Rudick RA. Multiple Sclerosis Functional Composite (MSFC): administration and scoring manual (online). Available at: www.nationalmssociety.org/mucs_msfc.asp. Accessed January 13, 2003. DeLong ER, DeLong DM, Clarke–Pearson DL. Comparing the areas under two or more correlated receiver operating curves: a nonparametric approach. Biometrics . 1988; 44: 837–845. StataCorp. Stata Statistical Software: release 8.0. College Station TX: Stata Corp., 2003.